The Chinese Association of Fiji showed its appreciation of the Fiji Corrections Service’s maintenance of cemetery sites through the donation of a brush cutter and gardening tools. 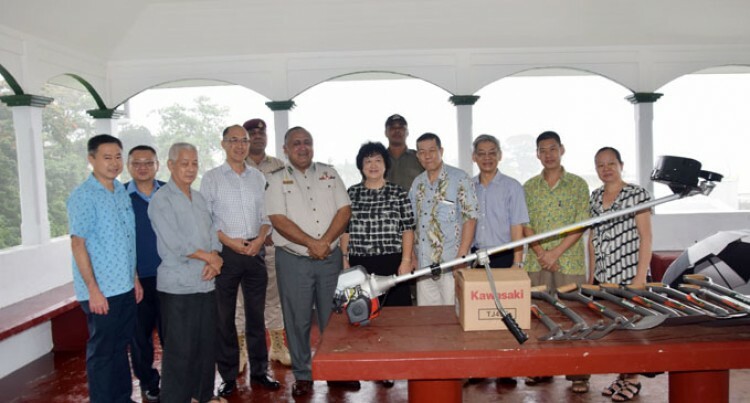 Association president Jenny Seeto while handing over the equipment to the Commissioner of Corrections, Commander Francis Kean, said they were grateful for the improvement carried out to the degraded pavilion house (kiosk) and the construction of steps at the Chinese Cemetery entrance. “The Fiji Corrections Service has done a good job in renovating the degraded pavilion house and they have put steps at the entrance to improve our safety,” Ms Seeto said. “It used to be a challenge for pall bearers during funerals as it was usually hard and slippery,” she said. Commander Kean acknowledged the Chinese association for their donation and continuous support towards the service. He said the donation would greatly assist them and those under its care in maintaining the site. “We want to ensure that we have a place where family could come; a visiting place for the elderly and relatives coming in to visit their loved ones,” Mr Kean said.